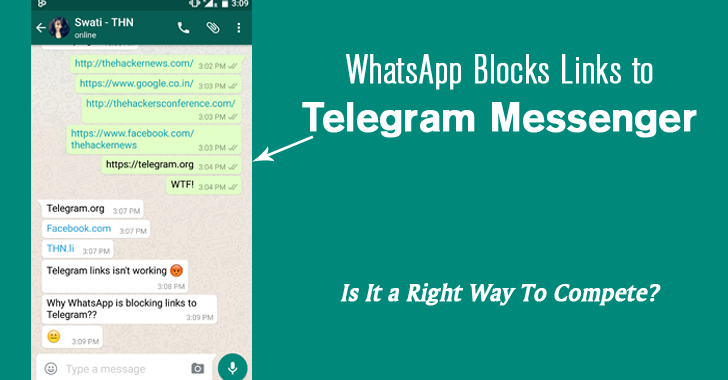 Telegram users are noticing that WhatsApp is blocking any links to the privacy-oriented messaging service Telegram.me. Although users are free to send or receive Telegram links on WhatsApp, the links appear as non-clickable that you cannot copy or forward. This strange behavior was first noticed this morning by Telegram users over on Reddit. The URLs – which are generally automatically made clickable – still appeared as plain text messages, but they didn't register as hyperlinks, blocking users from copying or forwarding them to other users or other apps. Read Also: How to Auto-BackUp Your WhatsApp Data to Google Drive with Encryption. In general, this odd behavior is done with malicious URLs such as malware or spam. However, this strange behavior was not exhibited on every device. Only WhatsApp for Android is currently showing this behavior while Telegram URLs still work fine on the iOS version of WhatsApp. This issue only began appearing in WhatsApp Version 2.12.327, a silent update pushed earlier this morning. Telegram has confirmed the situation to The Verge that the Facebook, who owned WhatsApp, is indeed responsible for the issue, as the social network has used this link-blocking trick in the newsfeed and Messenger app before to prevent its users from visiting Torrent websites. "Typically after a media backlash, FB steps back and blames their intelligent filtering for the problem," said a Telegram spokesperson. "We expect the same to happen this time as well." However, Facebook and WhatsApp are yet to comment on the issue. The popular messaging app has not even acknowledged that a new update was pushed this morning.